Great location,shame about the rooms,in need of urgent update eg:rooms painted,bathroom renovation. Great location! Right beside the markets and around the corner from the beach. Staff is very friendly and the hotel is always spotless. Our room was very basic but it suited our needs for a place to sleep. Only complaint is the the wifi was spotty. Could only get it in the reception and beside the pool. But overall it was a great stay! Great location walking distance to all shops ,beach and restaurants would stay there again. Staff were very helpful & friendly. Location was central. Rooms were clean and tidy. Linen could do with an upgrade. All the staff were so friendly and helpful. The location and grounds of the hotel were terrific. The room was a bit run down, but still good and spacious. We have been back to the same hotel 9 times so I can really say we enjoy it...I have friends that say it is just too old...but I love it....The Staff are now like family and we will go again and again. The staff were fantastic and ensured that we had everything that we needed. The bathroom was dated but clean. we were put in a below average standard room for two (there is 3 of us) after complaining they put us in a deluxe room that we were supposed to have again for two only and a crappy fold out bed for my son. We then paid more money to be udgraded to a suite which was nice but that added $550.00 to our holiday. We had a lovely time at Melasti and would return again next time we go to Bali. Great position. Staff lovely. The only thing that I think could be done is access to the beach from the property. renovations made it a very average stay. Renovations are taking place and it made the place unpleadsant to look at and to be in. The pool was small with no bar and the toilet in the room smelt bad. People were friendly but spoke poor english. 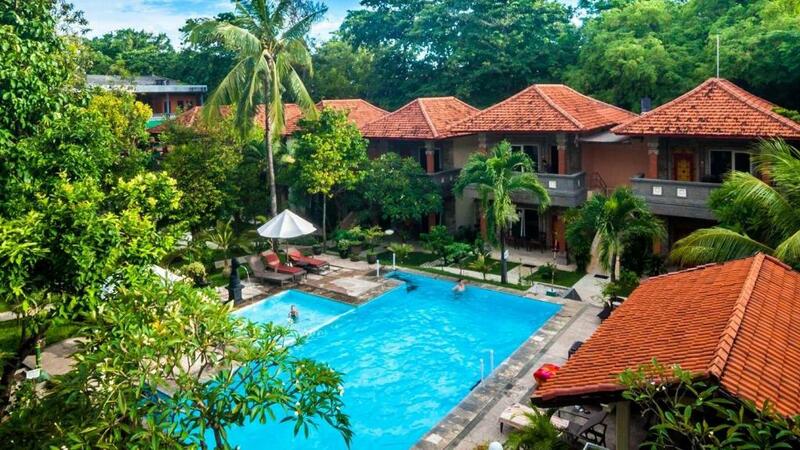 Overall a very enjoyable venue, central to everything within walking distance to the Discovery Plaza 12mins and 10mins to Kuta Sq. Staff were fantastic couldn't do enough to accommodate my every wish...highly reccommended. Excellent staff service, good food and location. The restaurant is not beach front, located on the street frontage. Although the property is beach front, the beach cannot be accessed from the property, have to walk about 8 minutes to reach it by walking around through the market. We found the melasti beach bungalows a wonderful place to stay. The rooms were huge and service was wonderful, the staff couldn't do enough to help. The resturant was great and daily breakfast was different everyday, they had a range of restaurants across the street , markets around the corner, huge department store around corner, a little convenience store on the property , spa at the melasti was divine, we are definitely staying at the melasti again , a wonderful Holliday. great location, good variety breakfast buffet. 2showers in room handy if 3 of you in room..
quiet, backs onto beach, swimming pools gd..
staff friendly..dining area great people watching as it's at front of hotel..